The fate of three teams – Swift Current, Hamilton and Acadie-Bathurst – will be on the line in the final MasterCard Memorial Cup round robin game between the Pats and Broncos. The winless Broncos need a victory in order to force a tie breaker Thursday night against Regina. Meanwhile, a Swift Current win would give the Bulldogs a bye to Sunday’s final. Hamilton and Acadie-Bathurst each have 2-1 records after the Bulldogs defeated the Titan 3-2 on Tuesday. A Regina win would put the Pats, Bulldogs and Titan in a three-way tie for first. Acadie Bathurst would advance if that’s the case since they have the best goal differential in games not involving Swift Current. The Bulldogs and Titan have guaranteed at least a spot in the semifinal while Regina will be looking to win on Wednesday in order to avoid a tie-breaker game Thursday, followed by a possible semifinal the next night. Looking ahead to Wednesday night’s game, the Broncos will need to give goalie Stuart Skinner much more support than they did Monday night against Hamilton. The Edmonton Oilers prospect faced an unprecedented 56 shots while the Broncos only fired 22 on Hamilton’s Kaden Fulcher in a 2-1 loss. 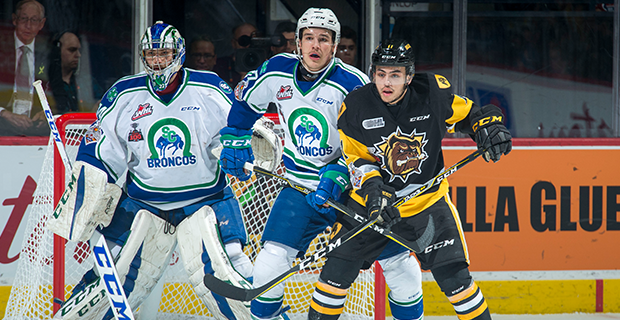 Swift Current has also relied on overage forward Estephan Giorgio, who has contributed on all Broncos goals in the tournament with two goals and two assists. New Jersey Devils prospect Colby Sissons, Swift Current’s leading scorer among defenceman this season, has a goal and two assists. For Regina, captain Sam Steel is third in tournament scoring with six goals, including five assists. Nick Henry and Josh Mahura have been important as well with two goals and two assists each while Cameron Hebig has a pair of goals and an assist. The Pats are coming off a remarkable comeback attempt that fell short on Sunday. Trailing 7-2 against the Titan in the third period, Regina trimmed that deficit to one before ultimately falling 8-6 on an empty netter. A big question will be whether they opt to go with rookie Max Paddock or veteran Ryan Kubic in goal. Paddock has started both games for the Pats, but was pulled in favour of Kubic after allowing six goals on 32 shots on Sunday. In the Tuesday night game, Robert Thomas and Ben Gleason each scored a goal and an assist to lead Hamilton to victory. The Titan’s Jeffrey Truchon-Viel now has a tournament-leading nine points after scoring a goal and an assist while NHL Draft eligible defenceman Noah Dobson is second with seven points after recording a pair of assists. Samuel Asselin also scored for the Titan and now has a tournament-leading four goals while Nicholas Caamano scored for Hamilton. Fulcher has had a great round-robin with a 2.01 goals-against average and .931 save percentage.